A POWERFUL NEW EDITION DOCUMENTING ONE OF THE GREATEST AIR BATTLES OF WWII. 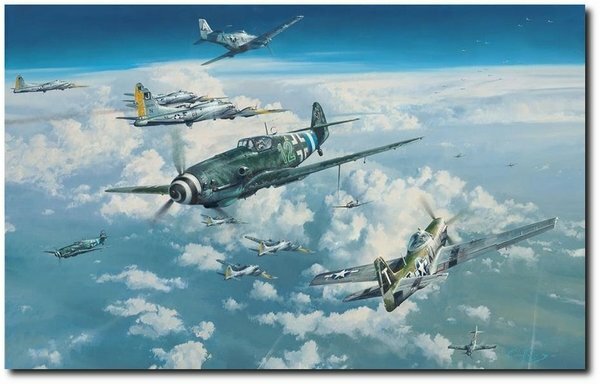 Robert Taylor's painting captures a moment during that massive aerial battle as enemy fighters from JG300 and JG301 make a head-on attack through a close formation of B-17s from the 390th Bomb Group near Ludwigslust. But their ever-vigilant P-51 escorts quickly engage the enemy with devastating results. In the centre of the action Flt Lt Joe Peterburs of the 20th Fighter Group screams past the Bf109G of Lt Bruno Klostermann from II./JG300 who is attempting to penetrate the bomber formation. Peterburs scored a victory over an Fw190 in the ensuing battle, Klostermann, however, will not survive the day. 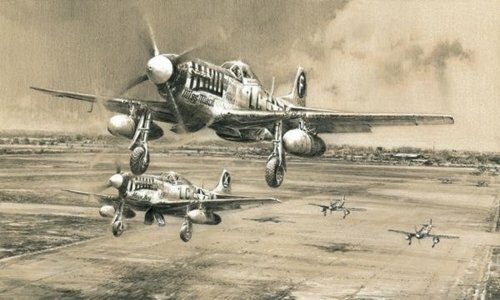 We are proud that the prints are autographed by iconic USAAF and Luftwaffe veterans who fought during the Defense of the Reich, adding great historical importance to this stunning release. Sadly many of the signatories are no longer with us, giving aviation art connoisseurs a rare opportunity to acquire a remarkable and valuable collector’s piece. on the morning of 14 January 1945.
who flew during this crucial period.